Katharine Heffernan, a freshman, stands in line at the University of Arizona Bookstore on Jan. 15 to hear information about the alternative option to rent textbooks instead of buying them. 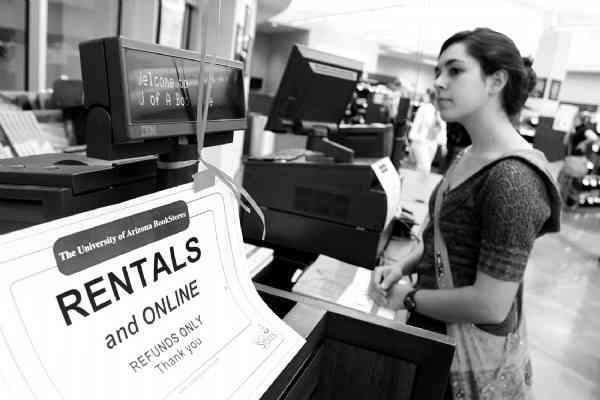 TUCSON, Ariz. (AP) - With textbook prices continuing to put a strain on students' wallets, University of Arizona Bookstores are trying to provide some relief by offering a textbook rental program. Cindy Hawk, associate director of UA Bookstores said the single aim of the program, which started several semesters ago, is to help save students money on their textbooks. "It got started because we were looking for options for the students to reduce the price of textbooks," Hawk said. "It is a growing program we started with two titles. This semester, I think we have 19 titles available, but it fluctuates depending on what classes are being taught." Hawk said the reason the program has not expanded beyond the current number of titles is because the bookstore requires instructors to make a multiple semester commitment to continue to use a textbook before the bookstore will make it available for students to rent. "We feel we need to have four consecutive semesters so those are the courses we look for, but we are definitely looking to expand the program because we feel that it saves the students money on textbooks," Hawk said. Alison Hom, a pre-business junior, said she decided to try the book rental program because it seemed like an easy way for her to save money. "The books are expensive," Hom said. "(I decided that) renting it would be the cheapest option. It would make it more reasonable just because the book was almost $200, and to rent it for $40 was the cheapest thing." Eric Hudson, a pre-pharmacy sophomore, said it was a good idea to be able to rent textbooks, but he felt that just was not a good option for him. "I don't really want to do book rental - well, actually, I don't really even like to sell my books back - I like to keep them to review so that I can study later," Hudson said. Hudson said the program seems to lend itself more to large general education classes. "A lot of the classes like my TRADs and INDVs I don't really care about, and the books - I don't want to spend $80 on a joke history book," Hudson said. "I would definitely use the book rental program for something like that." While Hawk says the book rental program makes sense for some students, she admits that it may not be the best idea to rent if the student will be required to use the book for more than one semester. "If you have a chemistry class that is like chemistry 101A and 101B and you would use the same book twice, it's not saving the students money if they have to rent it for two semesters," Hawk said. Hom said the textbook program has allowed her to cut her usual semester textbook bill of $300 in half, and the only real difference is that she does not get any money back at the end of the semester. "It is actually pretty cheap for me just because at the end of the semester I'm not going to get (as much) money back for my book as I paid for it," Hom said. Hawk said the program is not limited to large general education classes, and they would try to rent any book they felt students would be interested in. "Ultimately, we're interested in anything we can rent," Hawk said. "The ones that we really focused on as we approached faculty were the really expensive books - if they sold for $75 or more - because those, of course, are the ones that hit you the hardest in the pocketbook." "... we were looking for options for the students to reduce the price of textbooks. ... I think we have 19 titles available, but it fluctuates depending on what classes are being taught."